Montreal/Vancouver | Reuters –– Canada’s biggest rail union said no progress had been made in negotiations on Friday with Canadian Pacific Railway to reach a deal before a Saturday deadline as worries about a potential strike weighed on the country’s crude oil prices. If the two sides fail to reach a deal, a strike is due to start at 12:01 a.m. Saturday. Management and union workers are grappling over issues such as schedules to reduce fatigue management, the union said. A work stoppage would add hurdles for shipments of potash, crude oil and grains as demand soars for already congested rail service at CP and its larger rival Canadian National Railway. Chris Monette, spokesman for the union, the Teamsters Canada Rail Conference, said “negotiations have not progressed at all.” The union represents about 3,000 CP locomotive engineers and conductors. System Council No. 11 of the International Brotherhood of Electrical Workers (IBEW), which represents about 360 railroad rail signals staff at Canada’s second-largest railroad, also plans to walk off the job at the same time. A CP spokesman was not immediately available for comment but the company said Wednesday it would continue to bargain in good faith and remained committed to achieving a win-win solution. 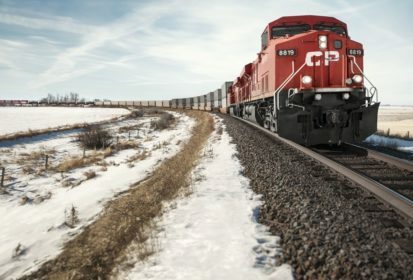 The Ag Transport Coalition, representing various players in the Prairie grain industry, said Friday CP has advised customers a “structured shutdown” of its Canadian rail operations has begun. IBEW, in its letter of 72 hours’ strike notice to CP on Tuesday, told the company it expects all covered employees “to be at their place of residence” at midnight. Some analysts said Canada’s federal government would likely legislate strikers back to work. “I believe that if a strike were to happen, it will probably be short lived because so many commercial interests will be affected,” Edward Jones analyst Dan Sherman said via email. Western Canada Select heavy blend crude for May delivery in Hardisty, Alta., settled at $21 below the West Texas Intermediate on Thursday in thin trade, well above Monday’s settle of $14.40. Canadian oil prices trade at a discount to the U.S. benchmark and the heavy discount is expected to persist for the foreseeable future, as rising production in Alberta’s oil sands outstrips shipping capacity, with the rail uncertainty adding pressure to an industry already hurt by pipeline constraints. “It is another factor that illustrates the fragility of our export capacity at a time we are still working through supply overhang,” said Tim Pickering, president of Auspice Capital. Canadian Labour Minister Patty Hajdu said Thursday she expected all parties to stay at the table until a deal was reached. Wade Sobkowich, executive director of the Western Grain Elevator Association, said the grain sector already has a backlog of 6,058 railcar orders for CP to fill. “Even a stoppage of two or three days will create a loss in capacity that cannot be afforded,” he said by email. — Reporting for Reuters by Allison Lampert and Julie Gordon. Includes files from AGCanada.com Network staff.